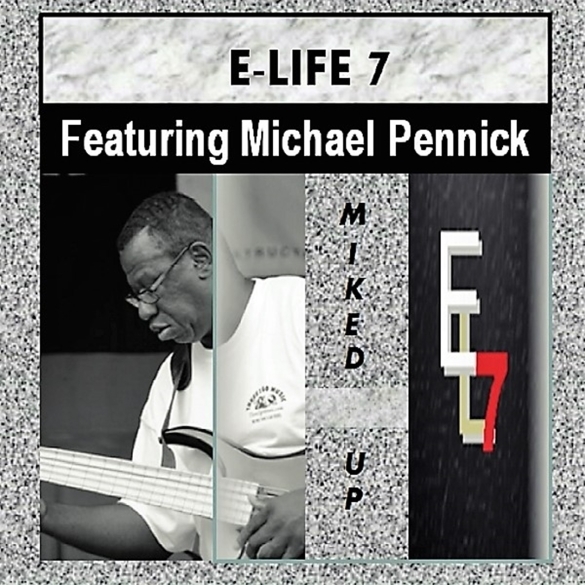 Three 2 Go Music introduces E-Life 7 Featuring Michael Pennick (EL7) and their debut album Miked Up. EL7 unites some of Western NY’s finest musicians on this release, including Michael Pennick on bass, Rodney Spears & Charlie Crymes Jr. on keyboards, guitarist Ron Walker, and drummer and percussionist Tim Webb. Special appearances by Ken Whitman (tenor sax), Walter Kemp III, Van Taylor (keyboards), Joey Diggs and Dee Osbourne (vocals) round out this stellar new 12-track album that spans Jazz, Soul, and R&B, all with a sound that remains unique to EL7. Miked Up will be released worldwide both physically and digitally by Three 2 Go Music on March 24, 2017. EL7 is the brainchild of Ron Walker and Mike Pennick, both long time members of Buffalo Music Hall of Fame R&B recording artists The Exoutics. While contemplating their musical future longtime friends Ron and Mike decided it was time to explore their Jazz alter egos and discover what lies beneath the tender ballads and funky R&B grooves they had been writing for years. EL7 acknowledges the musical and spiritual influence of past and present members of The Exoutics, and after a brief discussion, it was agreed that their next project would highlight the talent of bassist Mike Pennick. Eventually, this led to the formation of EL7. With extraordinary creativity and collaboration, the group conceived of and recorded Miked Up. Rodney’s unique keyboard accents are a perfect complement to the keyboard foundations played by Charlie. Tim’s intricate drum touch reinforces the rhythmic, melodic bass lines and spicy guitar licks. When blended together, what a unique sound! The project took several interesting twists and turns along the way, and each member shared creative ideas and opinions to help shape this outstanding release. The resulting album captures the flavor and passion of each musician, and audiences will enjoy and appreciate this special blend of Jazz and R&B. Miked Up covers the gamut of emotions, from the rhythm shifting jazz funk of “Chaos,” to the fun-filled, upbeat, and playful “Sunday Night.” The remake of Stevie Wonder’s “That Girl” and the intimate revelations of “Inner Beauty” and “Before the Storm” make this CD a pleasure to listen to, sure to appeal to the most demanding pallet. Enjoy Life, 7 days a week.